Here is our quick and fun video about how to make a simple forest den. Get about 12 long and reasonably straight sticks and tie them at the top using the paracord from the Mighty Eagle Den Kit. Stake them into the ground so they cant move around too much. Weave vines or green sticks through the uprights. The more leaves the better. Add a few few finishing touches and climb in! 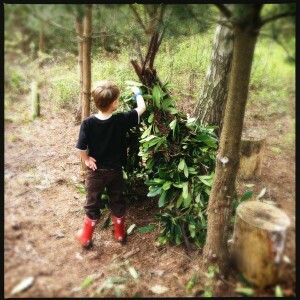 The Mighty Eagle Forest Den Kit, is a great hide away for an afternoon of fun with your kids. Dad’s make the best dens and now it is time to proove it!